Here's am ominous article from the Stanford News website explaining some of the work recently published in Science by Climate Scientists Noah Diffenbaugh and Chris Field. It explains how current models predict the average global temperature to increase by 5 - 6 degrees Celsius by the end of the century. The last time the planet had to adjust to this magnitude of temperature increase, ecosystems had thousands of years to adapt. But due to the unprecedented trajectory of climate change happening today, ecosystems are forced to adapt in only decades. If this trajectory continues, by 2046-2065 the average temperature of the Northern land masses will be 2-4 degrees higher. This means that the hottest summer experienced in the last 20 years will now occur at least every second year, if not more frequently. 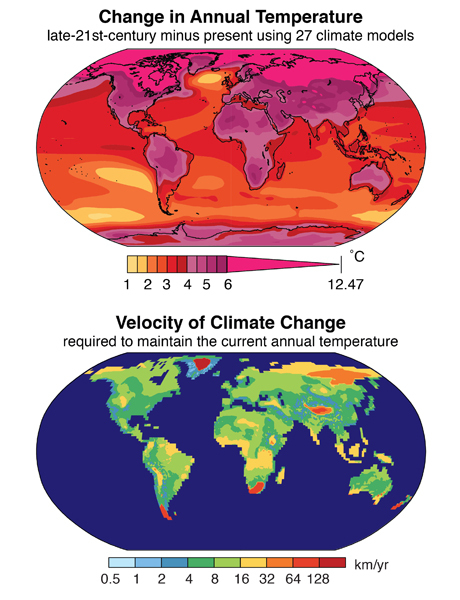 Note the colour of South Africa in the Velocity of Climate Change map - much of South Africa, particularly the Northen Cape and central interior are set to experience rapid climate change.